As symbolic celebration of reaching its 50th release, MS is proud to serve as a showcase for their highly personal album “Tropical”. A while ago, Celer introduced themselves in a heavy way, three CDs at once (see Vital Weekly 645), and now a new work on the Mystery Sea label, which continues their interest in water themes, as started with their collaboration with Mathieu Ruhlmann, which is now part of the archive of Vancouver Maritime Museum. Celer are Danielle Baquet-Long (pianos, words, custom electronics, tape-loops, theremin) and Will Long (pianos, custom electronics, tape-loops, arrangement diagrams and splicing), and they belong to the world of drone artists. The five pieces here are quite static in approach it seems: long sustaining drone pieces which only seem to move slowly around. There are changes to be noted, but only on the long curve. Field recordings are processed in one way or another – I hesitate to say computer, because I am told before they use reel to reel machines – to form these highly atmospheric music. Its a bit hard to see the aquatic theme approach here, which sometimes seems important for the label. However in terms of ‘deep dark ambient music’, Celer has quickly become an important player in the field. Of course its music that hasn’t much new to offer in terms of innovating the idiom of this particular genre, but Celer has mastered the genre very well and produced a most excellent work again. It would be good to expand more on the genre and see where it could also move into. Great for now at least. Celer are Will & Danielle and this album consists of piano, strings, radio, electronics, arrangements (? ), tape, words, bells and field recordings. I know this because it says so on the inside of the sleeve. That’s my question mark back there by the way, it’s not on the sleeve just in my head. It seemed a strange thing to write on the instrument list, but I digress. Tropical is a bit of a misnomer as titles go as there is a far more arid or tundra feel to Celer’s music than there is tropical. It consists of a series of stately, slow moving, round mid-range drones. There is very little superfluous decoration in the music. All the attention is focussed entirely upon the drones and their careful evolution. This is easily one off the nicest drone albums I’ve heard in a while and it’s found it’s way onto my seedee player many times over the last few weeks. It isn’t the most memorable of discs though with the tracks being fairly amorphous and vague. Another way of putting this though is that the tracks are quite amorphous and vague which is the very quality that has kept the album visiting my seedee player over the last few weeks as it’s almost impossible to get bored of them. Both version work for me depending on my mood. Definitely worth a listen but as it’s on Mystery Sea you already knew that. Celer (Will Long & Danielle Baquet-Long) have become a recognized name in this field. Admittedly, at first I was not entirely persuaded after hearing some of the (mainly) loop-derived early works that they had sent me – very kind-heartedly indeed – upon my request. Yet I’m almost sold, as today the duo easily fits amidst the region’s preeminent hypnotizers and everything experienced in this room – either self-released or published elsewhere – has been credibly charming since that initial approach. Tropical is one of those records composed on very few elements that, in the great scheme of things, result extremely momentous, determining a veritable change of mood during the listening session. Everlasting obscurities and consuming frequencies succeed at a snail’s pace, each time with increased potential; there were moments in which both my wife and myself remained with our mouths shut as mammoth mumbles bounced around the house, playing hide-and-seek in the corners of the walls. Although somewhat glacial in terms of sheer stimulus, the music possesses a sort of electronic porosity that renders its cryptic character wholly acceptable. This stuff influences the nervous system in a positive sense; no wonder that the Longs are also active in the area of musical therapy for children. A gorgeously humming album, highly recommended to real specialists who want to subject themselves to over 52 minutes of solemn stupor. To celebrate its fiftieth release, Mystery Sea could not have chosen a more appropriate artist. The duo of Will Long and the late Danielle Baquet-Long have refreshed the genre of ambient music with remarkable speed. Their prolific output has been matched release by release with glowing reviews. By the time Tropical was commissioned, their discography already boasted some thirty titles – in only four years. Since then, some twenty more have arrived. It seems inevitable that there should be at least some filler there, but the Longs´ ear for quality control would appear to be at least as sharp as their pitch-perfect aesthetic sensibilities. Mystery Sea itself is something of a phenomenon, a small, CDR label based in Belgium whose remit at first glance might seem as restrictive as its editions (usually only one hundred copies). The bearing idea is to promote works that all somehow reflect the properties of the sea, its amorphousness, its beneath the surface calm. And its strangeness. Remarkably, most every album differs radically from the rest while still remaining true to the label´s mission. For its part, Celer has often referenced rivers and great bodies of water in its compositions, one of which was in fact entirely conceived on board a boat in the Mediterranean. The warmer latitudes are also hardly foreign to the couple, as an album like ”Capri” testifies. And the swell and ebb and flow of water is the almost too on the nose metaphor for its music, which though largely the result of electronic manipulation is something of a force of nature. Tropical opens almost uncharacteristically moodily with ”Normal Sadness (The Softness of the Sea Hibiscus)” and remains more forbidding than uplifting throughout its fifty-two minutes. This is often standard procedure for Celer – a certain “presence” is captured and the rest of the record unfolds akin to variations on a theme. Somber but not sullen. 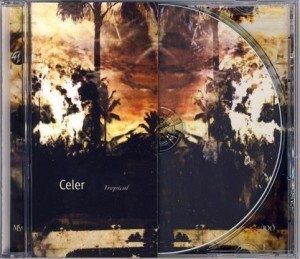 Tropical showcases Celer´s grace and sense of wonder. With customary patience and attention to detail, it evokes sun-drenched moments adrift, salt clinging to the humid air, the shoreline nowhere in sight. As always, the introductory statement for a Mystery Sea release by the artists were rather intended as setting a mood than providing background information: “Pouring out a summer spent in mint swims, everything that happened left the rush nowhere to fall”, the duo writes, “Drives through one-lane mountain roads, plane skeletons tattered remains in the hidden hills, all inactive and silent; there is little remembered. With unaware farewells, we’d rather remember the slow-motion dances under the soft glow of paper lanterns, the tracers from lightning bugs drifting into the endless blackness of the hidden inland.” With track titles such as “Normal Sadness (The Softness of the Sea Hibiscus)” or “Empty Hum (An Open, Empty Ocean)” the album seems headed for warm, marytime shores. On “[Tropical]”. For Mystery Sea, working with Celer perfectly suited their profile of featuring experienced yet still not universally known artists from around the world.